A beautiful Bahamian sunset greeted Condor Airlines Flight #2184 inbound from Frankfurt as it touched down for the first time at Nassau’s Lynden Pindling International Airport at 5:17 p.m. on November 6. On board were almost 130 passengers ready for a sunny reprieve from a frigid German fall. 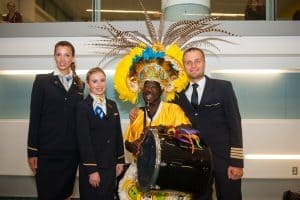 Nassau Airport Development Company (NAD) is delighted to join its partners at The Bahamas Ministry of Tourism, The Nassau Paradise Island Promotion Board and the Bahamas Out Island Promotion Board in welcoming this new weekly seasonal service connecting Frankfurt to Nassau, the gateway to The Bahamas. 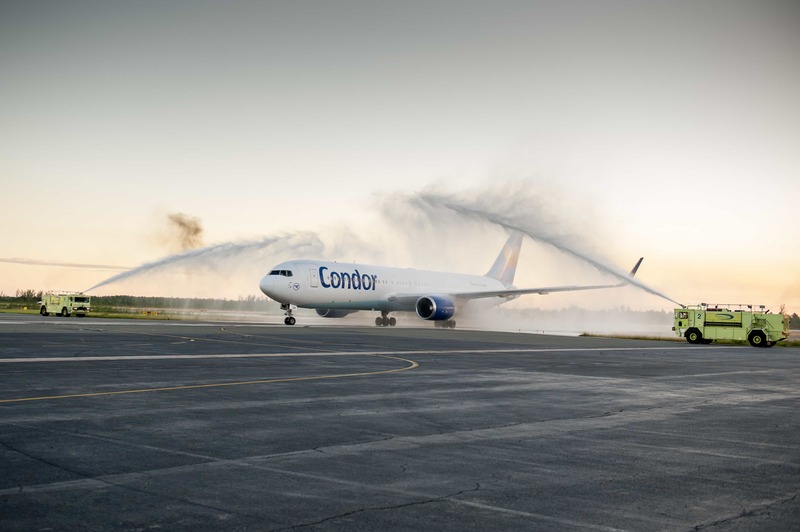 Upon arrival, the aircraft – a Boeing 767-300 series – was greeted with a customary water salute from NAD’s aircraft fire rescue vehicles. 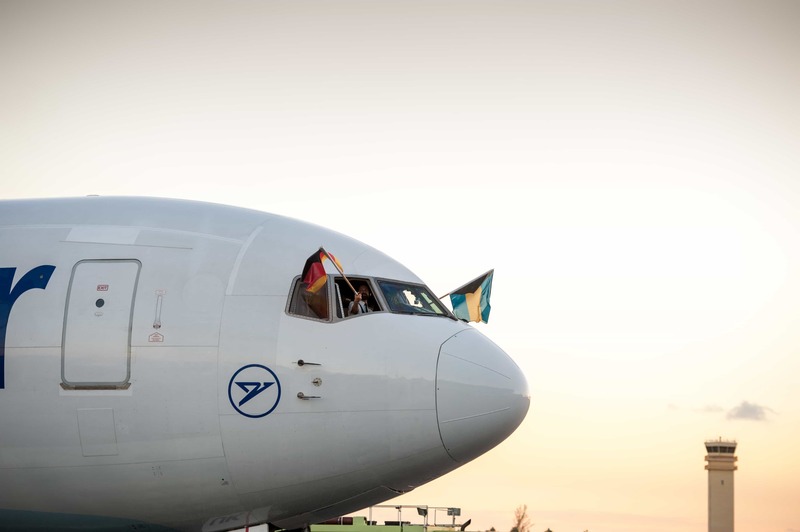 While taxiing to the gate, Bahamian and German flags waved jubilantly from the flight deck to mark the occasion. Representatives from NAD along with its tourism partners were on hand to personally greet each guest as they disembarked. 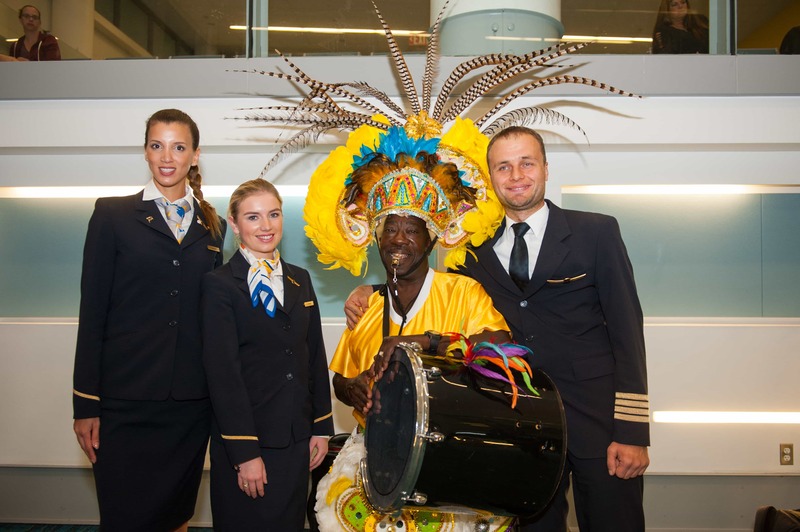 A traditional Junkanoo performer ensured that from the moment that passengers stepped off the plane, they knew they had arrived in The Bahamas. The addition of this Condor service to LPIA will yield powerful contributions to our tourism-driven economy. These include an estimated 18,555 room nights spent in local hotels over the course of the season, more than $8 million in visitor spend and the opportunity to market the stunning beauty and rich culture of Nassau and the out islands of The Bahamas to holiday seekers in Frankfurt and other key European markets.